The Arena of Liberty was superb in its colourfulness. As The SCOAN Choir sang and the congregation clapped and sang along with them, the angels of God suffused the ambience with their presence. 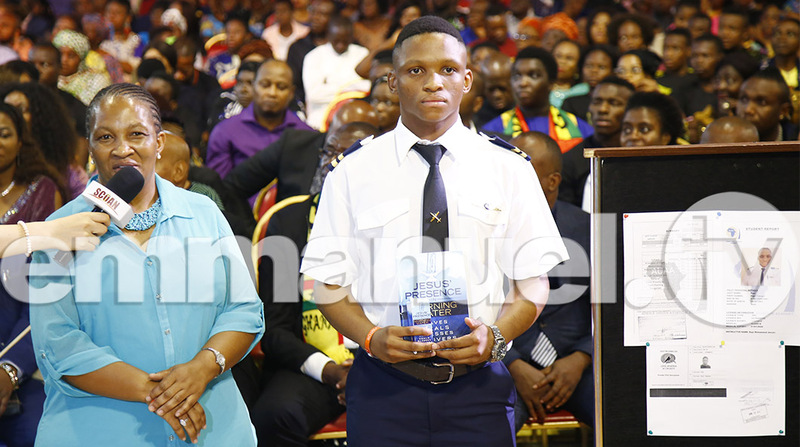 And as the cameras beamed it all to the world in high-definition technology, no human mind could have failed to relish the aesthetics of The SCOAN architecture, which was further enhanced by the delightful blue waters behind the altar. As water from the fountain dropped into the pool below, the ducks swam on in sheer happiness, giving a glimpse of the idyllic picture of heavenly bliss. Racine went to great lengths to show from Scripture how Christians need to develop a sense of fatherhood, which is a natural basis for prayer. Dwelling on the essence of Jesus in the Christian walk, he explained: “Jesus has brushed aside our unworthy past and brought us to the presence of God without any sense of unworthiness. This means a sense of righteousness brings an awareness of power and authority. A sense of righteousness brings an awareness of a sense of self-knowing and capacity to see the other side.” For a Christian to be able to command Heaven’s attention, he said, the key responsibility would be to trust the Holy Spirit and look to Him for direction in the Word. Citing Daniel’s perfect calmness when the decree against praying was signed, Racine urged true Christians never to operate in panic mode, even when the devil roars like a hungry lion around them. In perilous situations, Racine stressed, Christians have a duty to pray continuously in the spirit – what Prophet T.B. Joshua describes as praying in harmony with the Word of God, which in turn means praying in harmony with the will of God. “Thank You, Jesus! 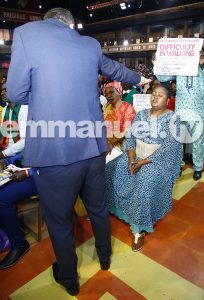 Thank You, Jesus, for healing me!” Those were the excited words of Mrs Chola Chisenga while testifying at The SCOAN last Sunday after her healing from difficulty in walking owing lumbar spine degeneration. After being struck by the condition, the 45-year-old Zambian restaurant owner became unable to keep on her feet or walk for long. Consequently, managing her restaurant became too difficult and she had to close it down. Meanwhile, she had moved from one hospital and church to another seeking healing. 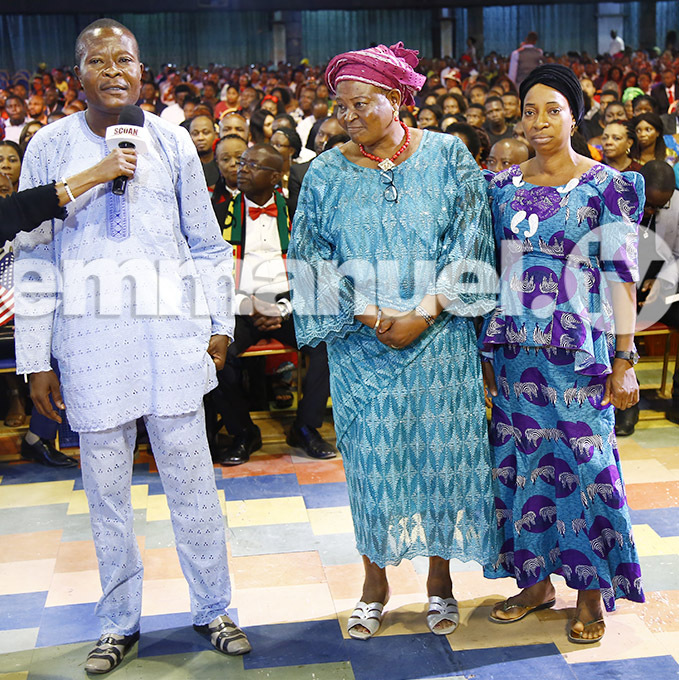 To the glory of God, after four years, Mrs Chisenga finally met the Master Surgeon, Jesus, whose wonder-working power surged through her as she received prayers at The SCOAN. During the prayers she had also received a word of prophecy about a fight with a man, and she confirmed it had in fact happened when she separated from her first husband. 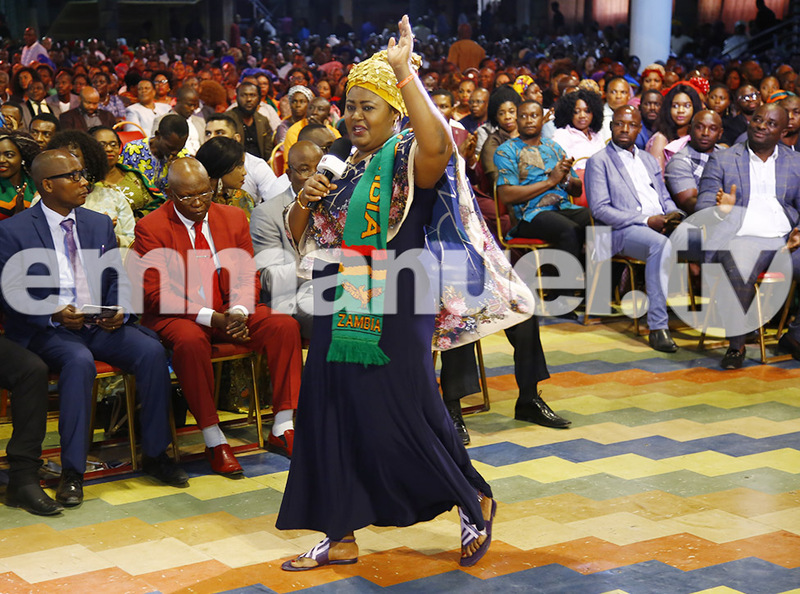 After demonstrating her healing by walking and bending her waist, Mrs Chisenga advised people to have faith and believe in Jesus Christ. The devil and his kingdom received shame when God freed one of their captives who had been bound with the chains of alcohol addiction. Barrister Abiodun Samson Adeyemo Samson had been doing well in his law practice, but the whole story changed when the spirit of drunkenness crept into him. Becoming a shadow of his former self, Barrister Adeyemo would drink himself to stupor and his family would sometimes have to, shamefacedly, pick him up from gutters in the neighbourhood. Barrister Adeyemo confessed that for over 20 years he could not function without large doses of alcohol in his system! Realising he had a problem, Barrister Adeyemo had visited several prayer mountains and hospitals but his obsession refused to leave. It was in December last year that he encountered God through the New Morning Water that his sister gave him to drink after witnessing him crave uncontrollably for alcohol. “I started vomiting and vomiting and vomiting,” Barrister Adeyemo recalled. Then he asked to be taken to The SCOAN. 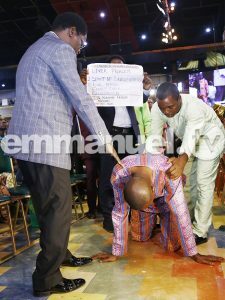 At the touch of the man of God, Barrister Adeyemo suddenly felt a closing up of that part of his stomach that kept demanding alcohol. The man of God also prophesied that the barrister had in fact been initiated into alcohol addiction by friends who charmed his drink. Now he can eat well and no longer craves alcohol. 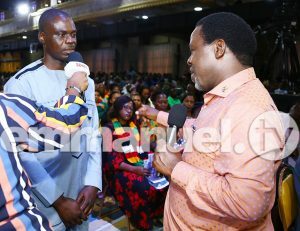 Urging people to stay off alcohol, Barrister Adeyemo suggested moving closer to God and godly things so that one will not easily fall for the devil’s antics. Accompanied by his supportive wife and sister, Barrister Adeyemo expressed amazement at the ease and speed of his deliverance. “Before going out, now I pray instead of drinking – I now have passion for Christ,” he concluded. 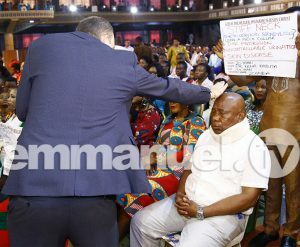 Although a medical doctor himself, Zambian Kena Kabuta, a 64-year-old, had suffered severe discomfort in his neck for 20 years until the Lord Jesus Christ visited him at The SCOAN. His major condition was stiff neck due to cervical spondylosis but he also had disc protrusion, uncontrollable urination and skin disease. For the stiff neck Dr Kabuta had to rely on a neck collar to ease his condition only slightly. He could not sleep well and had to rely on a cocktail of drugs for the little sleep he got. Inevitably, he could not do his work effectively and other doctors had suggested an operation, which he declined. Having exhausted all human means to get a cure, Dr Kabuta came to church in company of his loving wife. 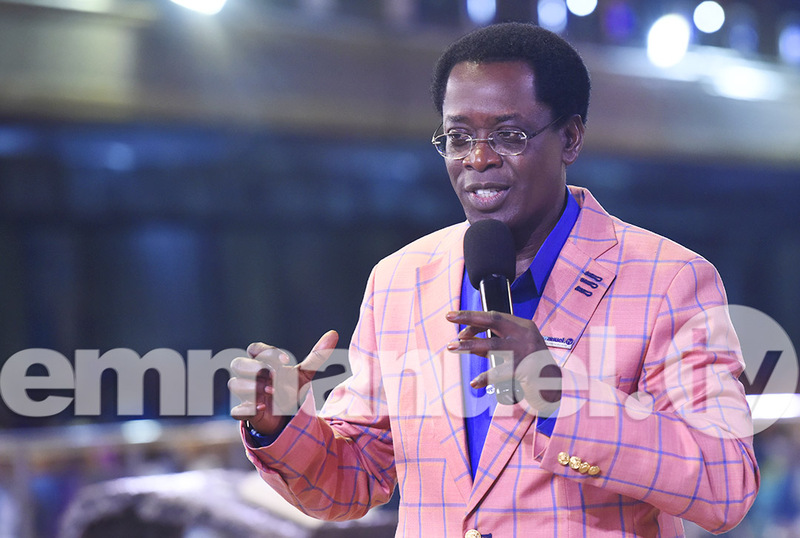 After prayers, Dr Kabuta instantly got his healing. During the testimony, he turned his neck left and right as well as up and down. Declaring himself totally free from pain, he told his listeners not to lose hope whenever in crisis and to see Jesus as the true Healer. 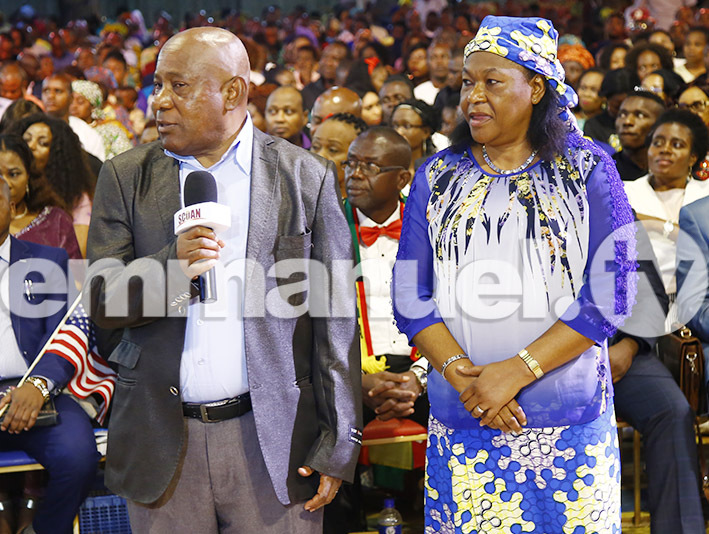 On the prophecy about the shaky state of their marriage, Mrs Kabuta confirmed that things had not been well between them but she believed God had now taken control. Emmanuel! A PILOT AND HIS FLYING COLOURS! Paul Tebogo Papi had wanted to qualify as a Private Pilot. To do this, he of course had to enrol in a flying school and pass the exams that would earn him a license. The devil knew this and, in his usual mischief, tried to mess with the young boy’s brain. Around 2015 he attacked the boy by giving him bad dreams and nightmares, making it difficult for him to concentrate in high school – just to stop him passing his exams. Being the caring and concerned person that she was, Paul’s mother ran to The SCOAN and got the New Morning Water and New Morning Sticker, faith tools with which she prayed with her son. Then in 2017 she nudged him on to enrol for the pilot’s training. As he was about to write one of his crucial papers, Paul became dizzy and confused. In faith, he fished out his Morning Water and ministered it on his head, saying, “Lord Jesus, take more of me and give me more of You!” And what happened afterwards? You guessed right – Paul passed his exams in flying colours, despite all of the devil’s tricks! Today, Paul Tebogo Papi has his Private Pilot License! Aware of God’s role in human affairs, Paul encouraged the youth to strive to achieve their goals through hard work and faith in God. It was 17 years ago when Mr Cornelius Ogbu, a Nigerian, put a young Beninoise woman, Hadiza, in the family way. Not then ready for fatherhood, he had told the woman to have an abortion, giving her the money for it. However, the woman failed to have the abortion even though she had promised him she would. After she had the baby – a boy – she informed the father, who came by to have a look-in, having by then moved to Ghana. When the boy turned seven, Mr Ogbu showed up again asking to be handed custody of the child. But, perhaps predictably, the boy’s mother’s response had been something like: ‘Not on your life – I’ve suffered so much alone to raise this boy. Back off!’ The journey to the reunion had all begun with a prophecy from man of God Prophet T.B. Joshua, who had discerned that Mr Ogbu had high blood pressure and a male child who was not in his custody. Ever the humanist and lover of people and family, Prophet T.B. Joshua spared no expenses in locating the boy and his mother. And he had them brought to church that Sunday morning! Oh, it was such a tear-jerking scene as blood called out to blood when Mr Ogbu’s other children embraced their older brother – in sheer innocence! Concluding his testimony in the presence of his understanding wife, Mr Ogbu asked God for forgiveness while promising to do right by the child.